We are delighted to see the support from the community as you continue to contribute outstanding articles showcasing new concepts of exceptional significance to the materials science readership. To celebrate the materials science community’s excellent work, we have picked out some content highlights for 2018 so far, which we would like to share with you. All articles are free to access until the end of June – we hope you enjoy reading them. At Materials Horizons, our reviewing standards are set extremely high to ensure we only publish first reports of new concepts across the breadth of materials research. Our impact factor of 10.706* is testament to the exceptionally significant work of our community. Click here for 2018 Highlights in our sister-journal Nanoscale Horizons or sign up to our newsletters for more regular journal-specific updates. QD2018 is the Tenth International Conference on Quantum Dots, the leading conference on quantum dot research and it will be held in Toronto, Canada from 25-29 June 2018. QD2018 will gather 500 of the world’s leading quantum dot researchers from epitaxial, colloidal, and lateral quantum dot communities. Fundamentals – Quantum Dot Theory, Quantum Dot Spin, Analytical Techniques, Quantum Optics and Magneto-Optics, Quantum Dot Coherence, Exciton/Charge Carrier Dynamics. Materials – Hybrid Quantum Dot Systems, Material Growth and Fabrication Techniques, Emerging Materials and Synthesis, Nanoplatelets and Superstructures. Applications – Energy Harvesting, Sensors and Detectors, Light Emission, Quantum Information Technology and Quantum Computing, Bio Applications. Materials Horizons, Nanoscale Horizons, and Nanoscale are delighted to provide support for QD2018. Visit the conference website for full information about how to register. Professor Martina Stenzel, from The University of New South Wales and one of our excellent Scientific Editors, has been elected as a Fellow of the Australian Academy of Science! As a world-leading researcher in polymer chemistry and its applications, she has provided vital support to Materials Horizons by upholding the stringent requirements of exceptional significance. Journal of Materials Chemistry B, Nanoscale Horizons and Materials Horizons are proud to support the 9th International Nanomedicine Conference. The International Nanomedicine Conference is regarded as the most significant nanomedicine meeting in the Southern Hemisphere, taking place annually at our local beach, Coogee Beach Sydney. This event will be brought to you by the Australian Centre for NanoMedicine (ACN) and the ARC Centre for Bio-Nano Science (CBNS). The conference aims to showcase great research, in an environment conducive to network­ing with colleagues from around the world. 10th CIRP Conference on Photonic Technologies – LANE 2018 takes place 3 – 6 September 2018 in Fürth, Germany. The meeting offers a platform for an international exchange of ideas, opinions, perspectives, results and solutions concerning photonic technologies. In order to give a detailed overview, the conference aims not only at scientific contributions, but integrates the industrial perspective and their relevance for application, as well. Materials Horizons is delighted to support LANE 2018 with two prizes for the best talks. Register before 4 June 2018 for early bird rates, or 9 August 2018 for standard rates. The 12th International Congress on Artificial Materials for Novel Wave Phenomena – Metamaterials’2018, will comprise a 4-day Conference (27–30 August), and a 2-day Doctoral School (31 August–1 September). Organized by the METAMORPHOSE VI AISBL (www.metamorphose-vi.org) and hosted by Aalto University (Espoo, Finland), this Congress follows the success of Metamaterials 2007-2017 and continues the traditions of the highly successful series of International Conferences on Complex Media and Metamaterials (Bianisotropics) and Rome International Workshops on Metamaterials and Special Materials for Electromagnetic Applications and Telecommunications. The Congress will provide a unique topical forum to share the latest results of the metamaterials research in Europe and worldwide and bring together the engineering, physics, applied mathematics and material science communities working on artificial materials and their applications from microwaves to optical frequencies, as well as in acoustics, mechanics, hydrodynamics and thermodynamics. Nader Engheta, University of Pennsylvania – Metamaterials for Informatics. Martin van Hecke, Leiden University/AMOLF – Complex Mechanical Metamaterials. Stefano Maci, University of Siena – Metasurface Design. Arno Rauschenbeutel, Technische Universität Wien – Chiral Quantum Nanophotonics. Materials Horizons and Journal of Materials Chemistry C are delighted to support Metamaterials’2018 with student prizes. Register before 25 June 2018 for early-bird registration rates. Visit the conference website for more information. We would like to highlight the Outstanding Reviewers for MATERIALS HORIZONS in 2017, as selected by the editorial team, for their significant contribution to the journal. The reviewers have been chosen based on the number, timeliness and quality of the reports completed over the last 12 months. 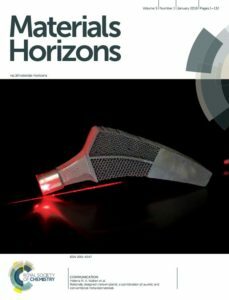 We would also like to thank the MATERIALS HORIZONS board and the materials science community for their continued support of the journal, as authors, reviewers and readers. Materials Horizons and Journal of Materials Chemistry A, B and C are pleased to support the 2018 International Conference of Young Researchers on Advanced Materials (ICYRAM2018). This conference aims to give researchers from around the world the opportunity to engage and network with peers, industry and friends, in the field of advanced materials. Specifically ICYRAM2018 gives a platform for researchers up to 15 years post-PhD to present their R&D. From 4 – 5 November 2018, Adelaide in South Australia will be the global focus for the scientific presentations, conversations, and chance meetings that will set forth the future discoveries and innovations to drive society forward. This 4th edition of ICYRAM, will build on the original mission by providing a fair and equitable event for all early stage researcher’s to meet, discuss and network in a safe and welcoming environment. Whether they be specialised materials researchers or those who utilise and apply materials to their R&D – ICYRAM2018 welcomes all. We are delighted to share with you some of the most popular articles that were published in Materials Horizons in 2017. Last year our Materials Horizons community published a larger number of articles of exceptional significance than ever before. We hope you enjoy reading this selection of some of the most highly cited* and most frequently downloaded articles from 2017. At Materials Horizons, our reviewing standards are set extremely high to ensure we only publish first reports of new concepts across the breadth of materials research. Our impact factor of 10.706** is testament to the exceptionally significant work of our community. *Web of Science (February 2018) © Clarivate Analytics. **2016 Journal Citation Reports (June 2017) © Clarivate Analytics. Is it feasible to convert nitrogen to ammonia using water and light? 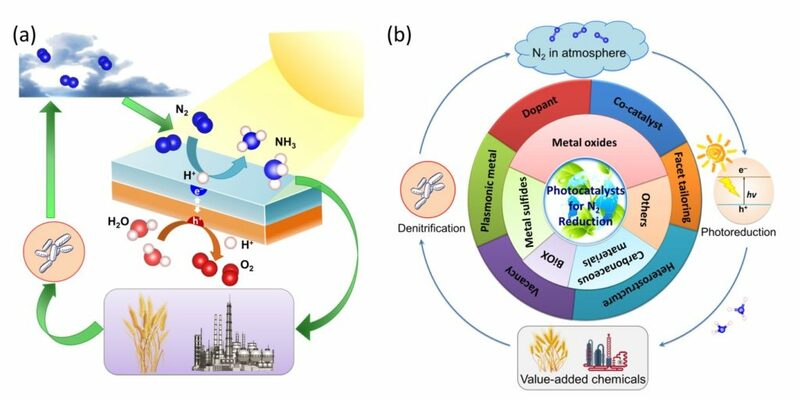 With international collaboration, scientists from China and Singapore have looked into the aspect of the state-of-the-art engineering of photocatalysts for the nitrogen (N2) fixation toward understanding the ammonia (NH3) synthesis. The work was recently reported by Dr. Wee-Jun Ong and co-workers in Materials Horizons, which is featured on the Inside Front Cover in Volume 5, Issue 1 in 2018. (a) An overview of the N2 cycle and circulation of N2 in various forms. (b) Diagram of the state-of-the-art milestone in the development of photocatalysts for N2 fixation. Images adapted from Chen et al., Mater. Horiz., 2018, Advance Article with permission from The Royal Society of Chemistry. N2 is one of the most abundant gases on the Earth, comprising 78% in our atmosphere. Nonetheless, N2 in the gaseous state cannot be effectively utilized by organisms. Therefore, N2 must be “fixed” to make it valuable by breaking the strong NN triple bonds to transform it into a form that can be consumed by plants, animals and human beings. Hitherto, two typical methods to realize the fixation of N2 are: (1) a natural and bacterial process, and (2) the Haber-Bosch process in industry. For the last 100 years, the N2 conversion has led to the commercial fertilizer production and sustained the food intake supply for the worldwide population. However, the Haber-Bosch process consumes high pressures and temperatures, hence demanding a huge quantity (~2%) of the fossil fuel source. Thus, it is envisaged that the alternative process, which utilizes nanomaterials to absorb photon to mimic the natural photosynthesis in green leaves, can act as a paradigm shift for fixing nitrogen. In this Review, the photo(electro)catalysts are classified based on the chemical compositions ranging from metal oxide to metal sulfide, bismuth oxyhalides, carbonaceous nanomaterials and other potential materials. The significance and relationship between the modification (e.g. nanoarchitecture design, crystal facet engineering, doping, and heterostructuring) and influences on the photo(electro)chemical activity of the catalysts are highlighted. Last but not least, to divert from the present laboratory-scale level to industrial applications, additional thoughts must be devoted to translating from academic research to practicality. How to amplify the yield of developed catalysts while preserving the intrinsic structures for the commercialization of “ammonia photosynthesis” is of universal challenge. Wee-Jun Ong is a member of the Community Board for Materials Horizons. Currently, he works as a Staff Scientist in the Institute of Materials Research and Engineering (IMRE) at Agency for Science, Technology and Research (A*STAR) in Singapore. His research interests focus on photocatalytic, photoelectrochemical and electrochemical H2O splitting, CO2 reduction, N2 fixation and H2O2 production for energy conversion and storage via experimental and density functional theory (DFT) studies. At present, he also serves as the Associate Editor of Frontiers in Chemistry and Frontiers in Materials, and an Editorial Board Member of Scientific Reports, Nanotechnology and Nano Futures. Check out his personal research website here.